If you’ve spent any time at all looking through Pinterest or any other means of bridal bouquet inspiration then you have seen them, Anemones, with their snow white petals encircling a dramatic dark center, peeking out of or taking center stage in stunning bridal bouquets. Also, Ranunculus, the round little flowers with layers on layer of petals in all sorts of bright and soft colors. We all fall hard and fast for this Spring blooming pair, and as farmer florist, we dream of harvesting our own to tuck into your bouquets and arrangements. The thing is, Ranunculus and Anemones are both a bit particular in their needs and I would be lying to say that it hasn’t been a bit of a trial and error process to figure these beauties out. However, once you succeed and see even just one cheery little face unfolding for the sun, you’ll be hooked like we are. Thankfully, last year we had a very successful go around and we are very excited to refine our process and especially to share what we have learned with you! Flourish flower farm is located in Eastern Lancaster County, PA in USDA Hardiness Zone 6b. In Zone 6, our last frost date in the Spring usually hits somewhere around May 15th, while the first frost can be expected between October 15th and 30th. If you are reading from another area, you may want to look up your zone and adjust your dates accordingly. 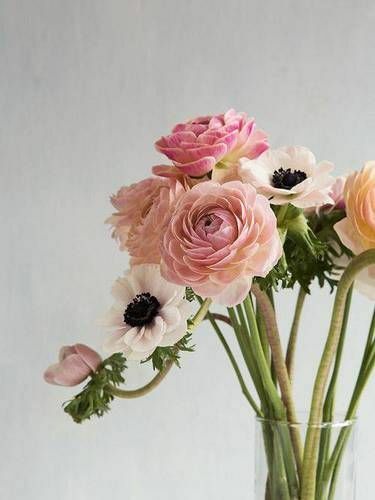 Anemones and Ranunculus are similar in their form and growing process, so if you can master one, you’ll likely have success with both. Although, we have learned that Anemones are a bit hardier than Ranunculus and not quite as picky, so you may want to start with them if you want to ease into this process. Both appreciate some exposure to cold temperatures (but not too cold) and will give you better quantity and quality blooms if planted out in the winter with proper preparation and protection. They both come as “corms”, which are pretty much just hard shriveled looking brown things that aren’t quite a bulb or a seed. This year we planted half of our order outside in December, with two layers of frost cover. We are hoping they will bloom nice and early. Our second planting is in the works now and will be planted out at the end of February to give us some later spring blooms. It is not too late to start your own planting! Follow along with the instructions below to get started, you won’t regret it! Before you plant the corms, it’s important to give them a head start inside. Step 1: Unpack your corms and soak in lukewarm water for 2-4 hours. It is best practice to have air moving through your water, either by leaving the sink or hose dripping into your container, or we’ve found that stirring it every now and then will suffice. Keep different varieties separate with labels so you can distinguish them throughout the process. Step 2: Once your corms have rehydrated and expanded they should feel softer and look larger. 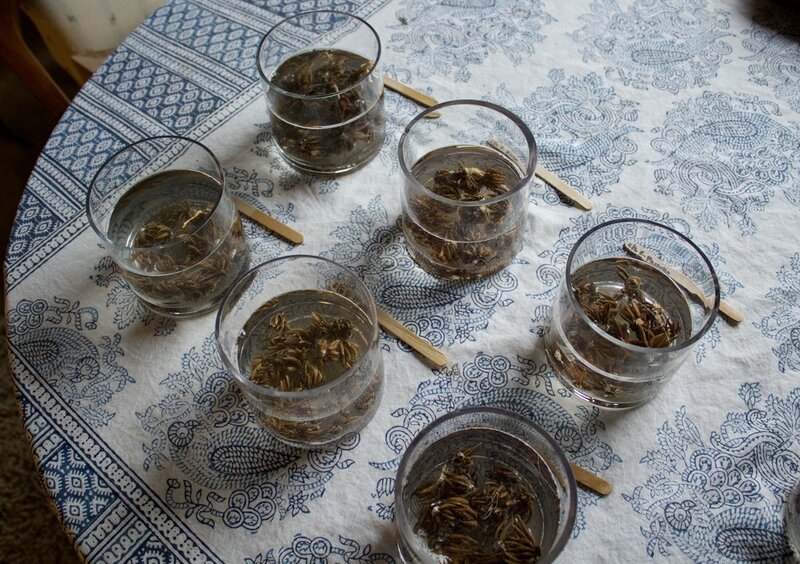 Ranunculus Corms after about 2 1/2 hours soaking. Anemone Corms after about 2 1/2 hours soaking. Step 3: Fill a tray, or container that has sides, with a couple inches of potting soil and then spread your corms on top of the soil. 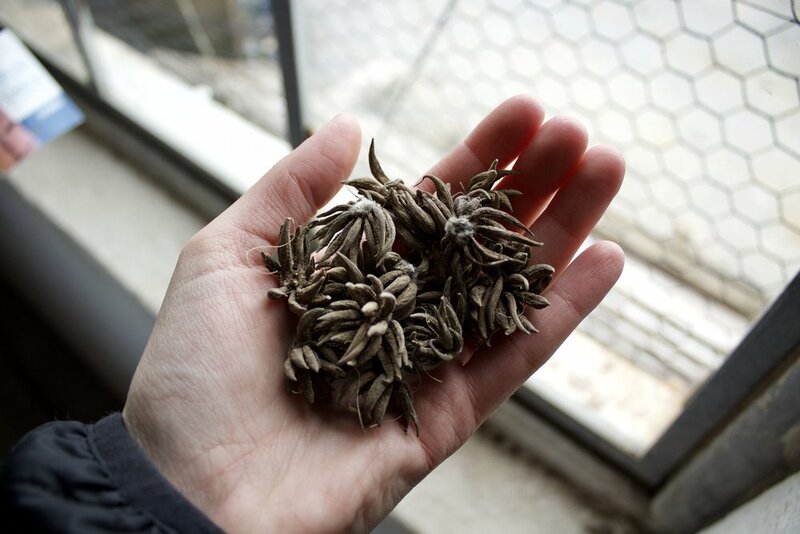 Place Ranunculus corms with the legs facing down into the soil and Anemones with the pointed end down. They can be pretty close together but not touching. You may also want to think about marking the different varieties so you know which kinds are where when you go to plant. 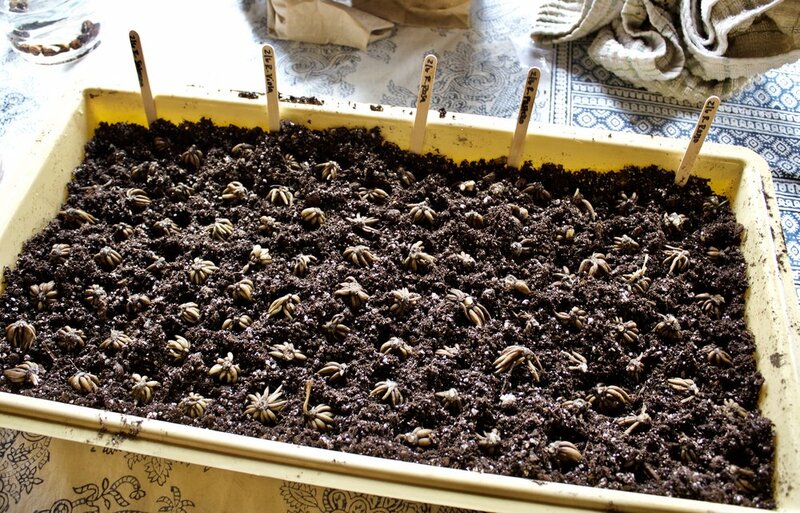 Step 4: Cover the corms with another two inches of damp soil and store in a cool, dry space to allow time for sprouting. Keep the soil moist during this time, but not soggy. Check the corms periodically. You should start to see little hairy sprouts under the soil in about 10 days, and green shoots with small leaves in about two weeks. Anemones and Ranunculus corms are ready to plant when they have sprouted roots and small green shoots are starting to emerge above the soil in your tray. You don’t want to leave them too long in that state or their roots will get too entwined and the shoots too long and weak. Step 1: Both Anemones and Ranunculus need to be planted about 2-3 inches underground, with pointy ends and legs pointing down, respectively. Anemones should have about 6 inches in between each plant and Ranunculus should have a little more, around 9 inches. 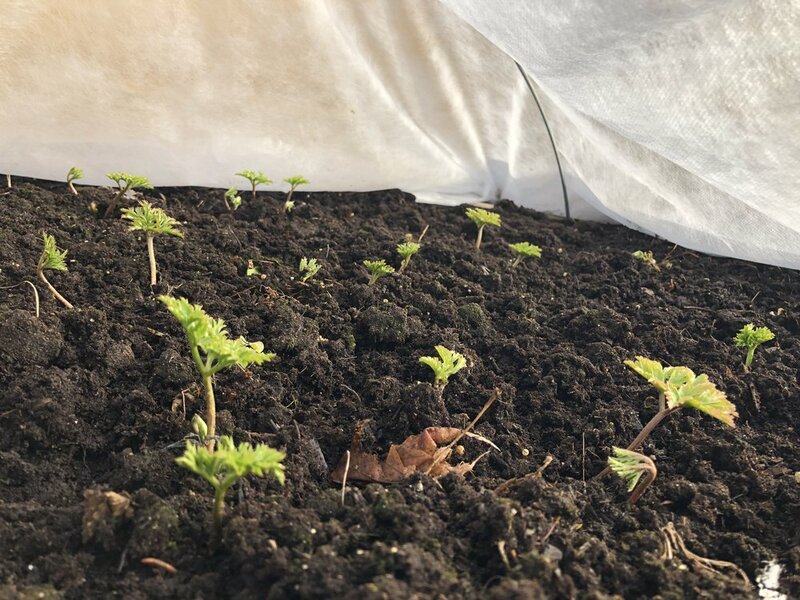 Step 2: We cover the planted area with small hoops and white cloth to keep the corms safe from frost but still allow water and sun to get in. It’s important that whatever cloth you use for covering does not touch the sprouts, or else they will freeze when a frost hits. Happy Anemones sprouting under cover. 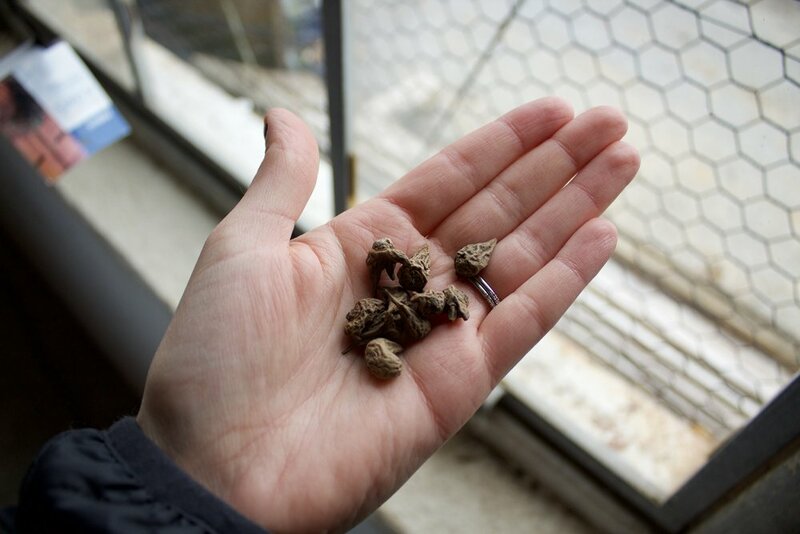 You can expect the plants to flower in the Spring and continue to bloom through May. Anemones and Ranunculus do not thrive in the high heat of summer and are usually wrapping up when June comes around, so make sure to enjoy them while they last! Thanks for following along and feel free to contact us with any comments or questions you may have. We would love to hear from you! 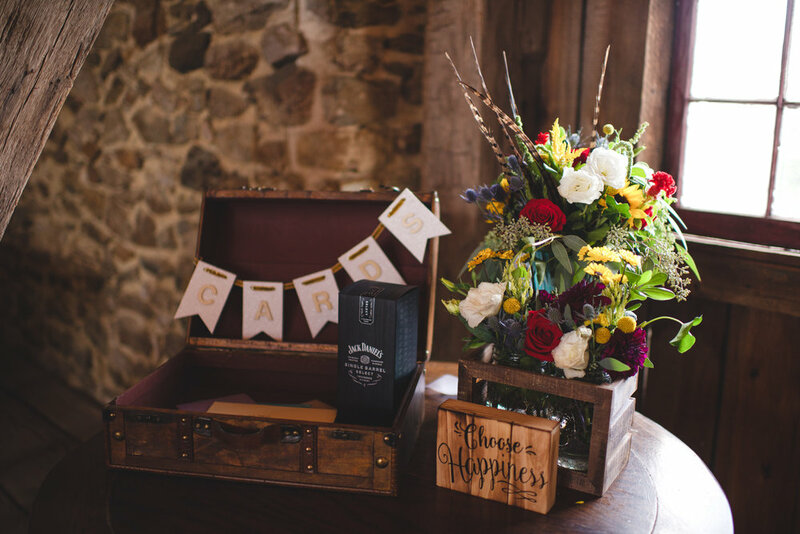 Ruthanne and Joe’s wedding took place at the Chestnut Hill Villa, a quaint little farm turned venue in Manheim, PA. Their pallet included colors that we designed with all throughout the 2018 season and expect to see more of next year. The blush and white tones accented by a deep red wine color is timeless and classy but can also take on whimsical notes when we let the stems carry the shape and texture of the designs as they will. Ruthanne wanted that free flowing look in her arbor decoration and we had so much fun bringing her vision to life! Thanks to Sarah & Issac Photography for sharing their work with us! The Bridal Bouquet: Creamy white Dahlias with blush Cafe Au Lait Dahlias and Roses. Our own Silver Drop Eucalyptus and Dusty Miller with touches of Seeded Eucalyptus for greens and texture. 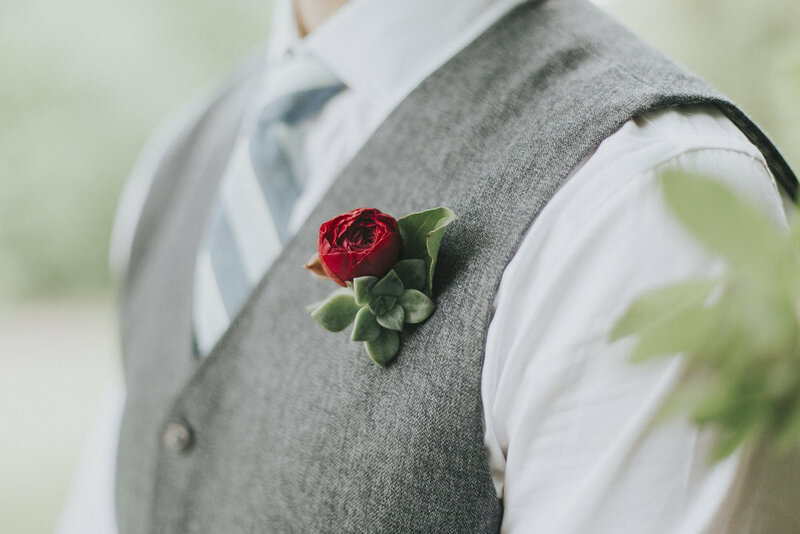 The Groom’s Boutonniere: Tiny deep red Dahlia with Dahlia and Lisianthus buds and Seeded Eucalyptus for texture and greens. We love how the long light colored dresses really make the flowers and especially the deep red dahlias pop! Blush Lisanthus boutonnieres for all the groom’s men. It’s nice to have the groom’s bout stand out with a different color, shape, or flower. The ceremony was framed by this asymmetrical arbor with two of our custom floral sprays and a simple white draped tulle. The perfect backdrop for the most important part of the day! 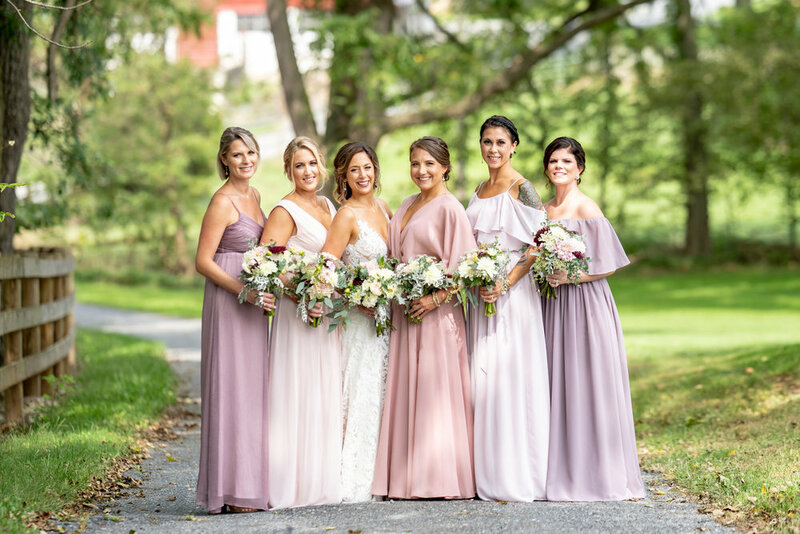 Heather and David’s early September wedding had all the right colors and blooms to celebrate the lightness of Summer and usher in the warm, full Autumnal tones. Their ceremony took place at the Winery at Hunters Valley in Liverpool on a bright sunny day that we had the pleasure to adorn with equally bright dahlias, roses, and lisianthus. Thanks to Lindsey Maree Photography for sharing the loveliest photos with us! 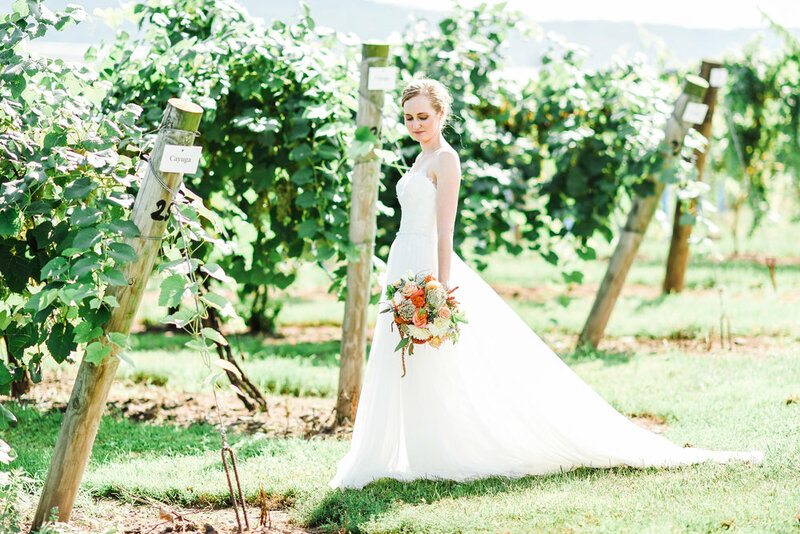 The Bride amongst the grapevines with her bouquet hanging gracefully at her side, the perfect capture! Of course the Groom is looking just as good getting ready for the big moment. The bouquets in all their warm pallet glory! Big roses, dahlias, and lisianthus carry the central elements of the girl’s bouquets with queen annes lace, hanging amaranthus, and seeded eucalyptus complimenting perfectly. 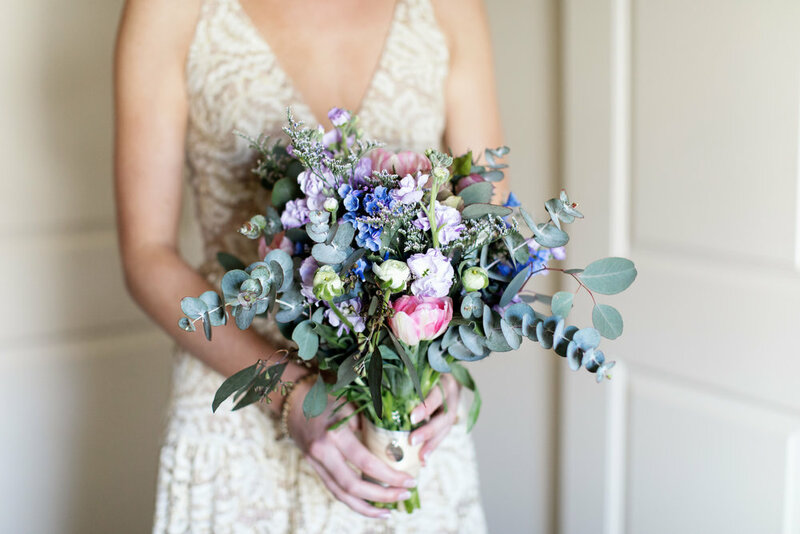 We love the little succulents peeking through Heather’s bouquet! They always add the sweetest touch in any season! Mason Jars are just the right size for accent arrangements among the reception or ceremony decor. They are so simple and always tasteful. 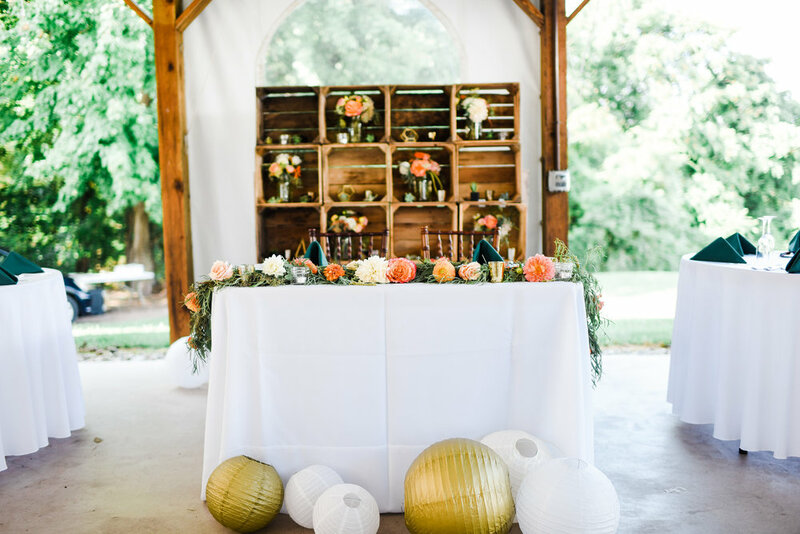 We just love the creativity on display here with the backdrop to Heather and David’s sweetheart table. Bridesmaid bouquets can always double as centerpieces or accent decor for the reception! And of course, we are ever in favor of a colorful garland to adorn the Bride and Groom’s table. Wrist Corsages are the perfect pop of color for moms or any honorary women to wear. Congratulations Heather and David! Thanks for letting us be part of your beautiful day! 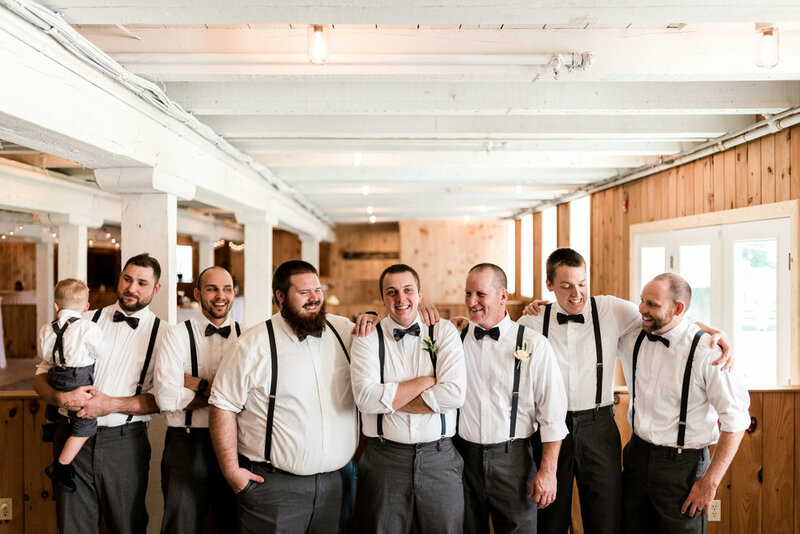 Kelly and Kevin's wedding was our first of the 2018 season and we were so very ready to get back to it when the time rolled around. The soft pastel colors and romantic yet simple style they envisioned was enough to make our hearts flutter! We are so pleased with these designs and hope you will enjoy the beautiful photos Janae Rose Photography graciously shared with us. The Bouquet: Blush Angelique Tulips from the field complimented by sweet smelling lavender and white stock and blue delphinium. Eucalyptus is almost a given in bridal bouquets these days and it pulls this one together elegantly with muted gray greens. The Bout: It's not often that we use tulips in boutonnieres but these sweet little ones seemed just right! 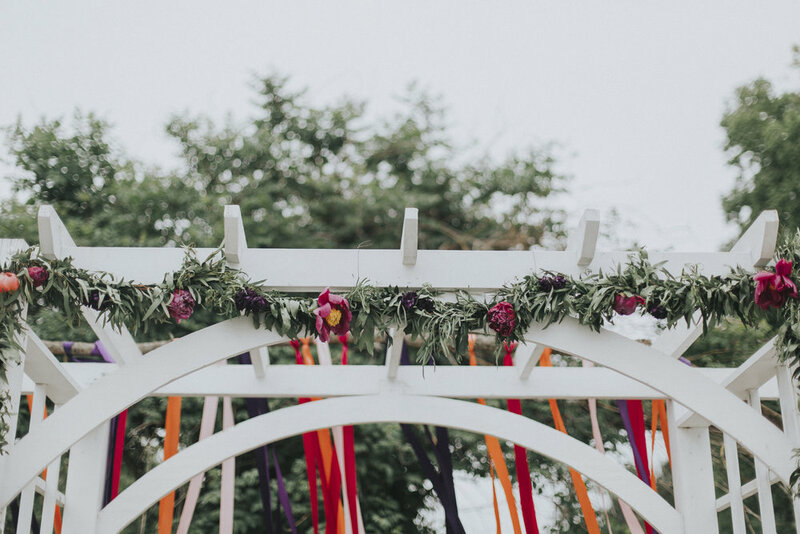 Ceremony flowers don't have to be huge and elaborate, an offset arbor spray and shepherds hooks bring just the right touch of color to frame an already beautiful setting. Hellebore are another great early Spring bloom that we recently started growing at Flourish. We love how these add a fresh bright green touch to these centerpieces in our mercury glass vases. Corsages are a special way to honor the older and wiser women in your life. Congratulations Kelly and Kyle! And thank you for the honor of adorning your wedding day. 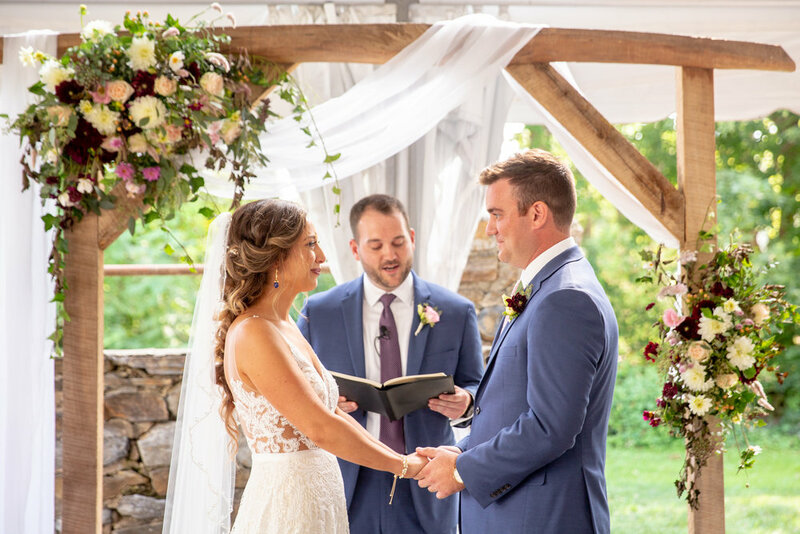 This stunning wedding takes us back to last Spring at the beautiful Harvest View Barn where Risa and Kerry tied the knot. Their style was classy and simple. The greens and whites of peonies, hydrangea, and eucalyptus were the perfect fit. They also chose to have some key floral accents for the ceremony and reception including a lush arbor garland, two large altar pieces to mark the beginning of the aisle, and statement centerpieces in our mercury glass urns for the tables. We are so grateful to Tree of Life Photography for the wonderful photos we get to share with you! The simplicity in these colors is so fresh and beautiful. Included in this altar arrangement are more peonies, hydrangea, and roses with baptisia and larkspur adding the sprawling texture and shape. A simple green and white garland can be the perfect accent to frame your ceremony. Mandy and Mitch were such a pleasure to design for and we are so happy to be able to share their beautiful wedding photos with all of you! Mandy chose some classic fall elements for her bouquet as well as some pops of the unexpected. Dahlias, sunflowers, and mums bring the autumn rich colors and feels, while succulents and eucalyptus add that fresh unique twist that blends so well here. 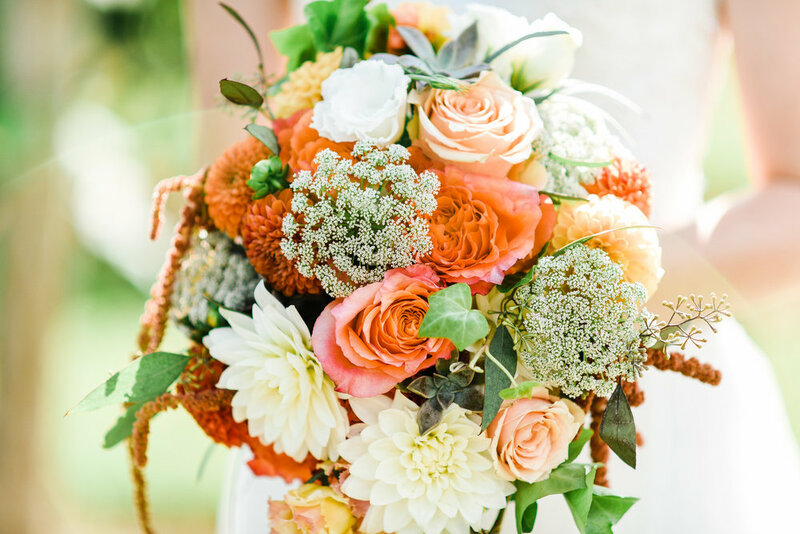 We love when October weddings roll around and we get to add those warm tones into our floral designs. Enjoy the following photos captured by April Elizabeth Photography! A little sprig of solidago for the groom! These flower girl pom poms are made out of fresh mums and are just the cutest carried by these girls down the aisle. Congratulations Mandy and Mitch! May your future together be as bright as your smiles and as full as your sunflowers. Ah, the end of September. A beautiful time for weddings both because of the often ideal weather and because our dahlias are in full bloom! Denise and Ryan’s wedding at Greystone Hall was nothing short of breathtaking, and we were honored to be part of it. The floral designs for their day were on trend in many ways; Denise’s bouquet was loose and lush, their colors were that deep wine, blush pink, and white that we can’t get enough of lately, and of course lots of silver dollar eucalyptus to pull everything together. We’re excited to share these photos with you, taken by the talented Vanessa Marie Photography. The Bride’s Bouquet: Red tones with blush, pink, and white dahlias and lisianthus. Dara and celosia for filler. Eucalyptus and Italian ruscus tie it all together. The groom’s boutonniere: Dark red dahlia, silver dollar eucalyptus and filler. We love how the bunches of flowers tied to the end of the rows add color to the aisle and lead your attention to the focal point at the arbor. These tall ceramic urns make the perfect statement altar pieces to be used up front or just to bring color to the surrounding venue. Another large statement arrangement to match the grandeur of Greystone Hall. So many fun accents to this wedding. This spray of flowers at the sweetheart table is just right to honor the special couple seated there. Another trend for centerpieces lately: These are thing garlands circling three pillar or floating candles. This adds color and life to the table without blocking anyone’s view. Congratulations to Denise and Ryan! Elizabeth and her mom came to us with visions of abundant floral focal points for her ceremony and reception, which we were more than happy to oblige! 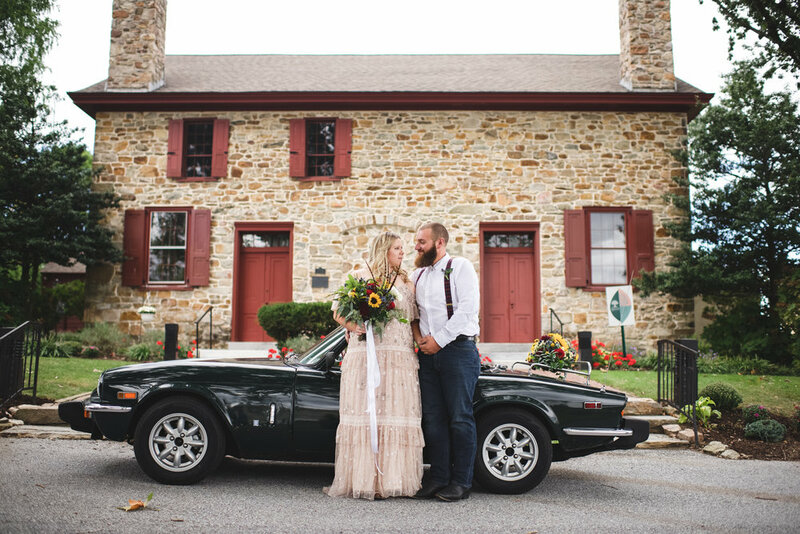 The wedding took place at the beautiful Rock Ford Plantation venue in Lancaster County Central Park on a warm June day. Some of our favorite projects among the many unique accents in this wedding include a giant floral wreath backdrop to the ceremony, a garland to adorn the getaway VW Bug, and a floral spray to decorate the cake table. 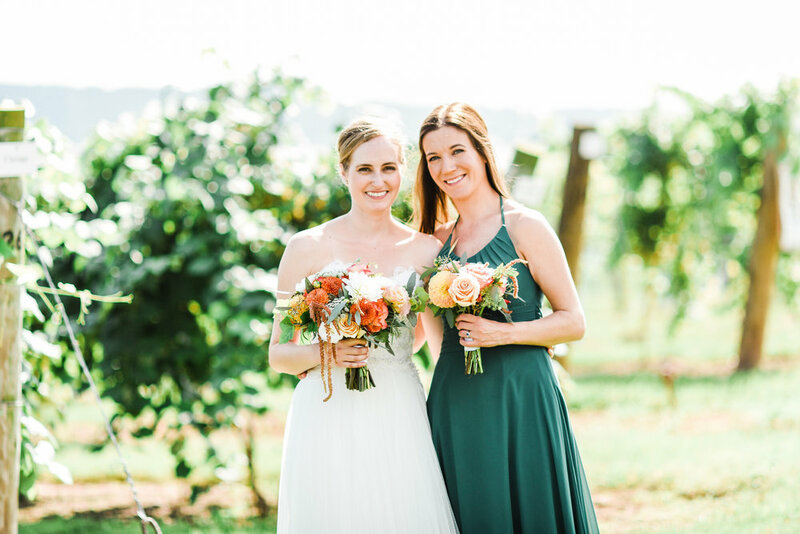 Enjoy the photos captured elegantly by Elizabeth Moore Photography. The beautiful bride and her lush bouquet full of summer favorites including peonies, snap dragon, ranunculus, stock, hydrangea, willow eucalyptus, dusty miller, pittosporum, and hanging amaranths- to name a few! This grinning father proudly wears his peony bud boutonniere as he waits for his father-daughter first look! A really fun and special moment to include in your day. Rock Ford Plantation is a stately and stunning ceremony backdrop. These small mercury glass cups make the perfect cocktail hour table arrangements. We love when our brides can reuse a focal point, like this wreath for the ceremony, and also the reception. We are excited to share another favorite wedding from this past summer. Katelin and Daniel’s special day was timed just right to be able to use our garden fresh peonies. These big lush blooms have been a long time favorite for creating full and colorful bridal bouquets that make quite a statement when carried down the aisle. Jenna Mummau Photography captured Katelin’s flowers so elegantly. Please enjoy! Adding pops of color to the brides bouquet while keeping the bridesmaid’s white and green is a great way to let the bride stand out. You don’t need many stems in a bouquet when working with peonies. Two or three with some fillers makes a sweet but full look. We had the great pleasure of adorning Kiera and Gabe's wedding this fall with draping bouquets, long garlands, and lots of other floral accents. We are of the opinion that the more flowers the merrier and this couple and venue were a dream to work with. Adam Naples captured our work and their celebration with so much beauty and skill! We are so excited to share these images with you! This late summer wedding is complete with all our blush favorites from lisianthus to dahlias, to those lush garden roses taking up the center stage in Rachael's bouquet. Blush has been on trend for a couple of years now and it continues to grow on us. 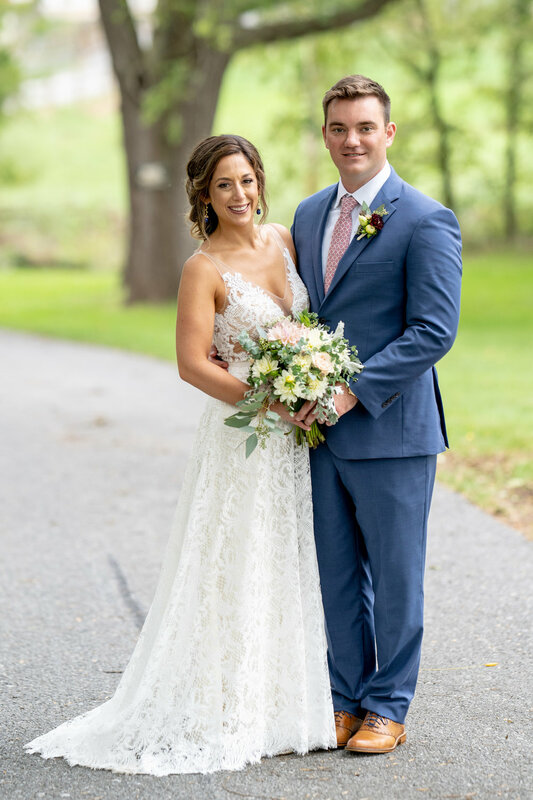 Needless to say, we were honored to bring the florals to Rachael and CJ's wedding at Moonstone Manor and ever so grateful for Tony Gibble Photography for capturing them so well! Annie and Evan's wedding was a really fun one for us to design. Annie requested some extra accents that we don't often get asked to do; including, pheasant feathers in her bouquet, a spread of flowers for a classic car, and an elaborate draping garland. We used sunflowers, dahlias, blue thistle, fever few, red roses, yellow mums, and eucalyptus to make her vision come to life. The two tied the knot at the Uwchlan Meeting House, a simple yet stunning backdrop for their special ceremony. 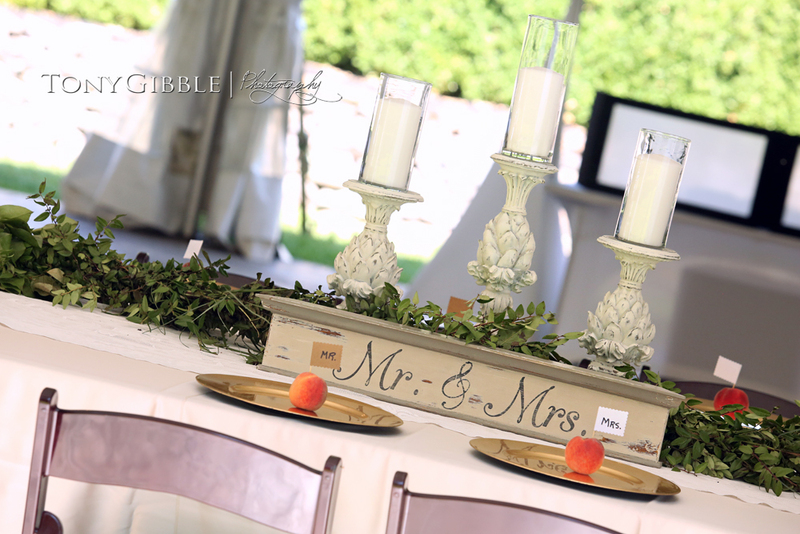 Enjoy the photos captured by Julie Floro Photography! Annie traded in her bouquet for a flower crown at the reception, a great idea to keep your hands free but still floral adorned! 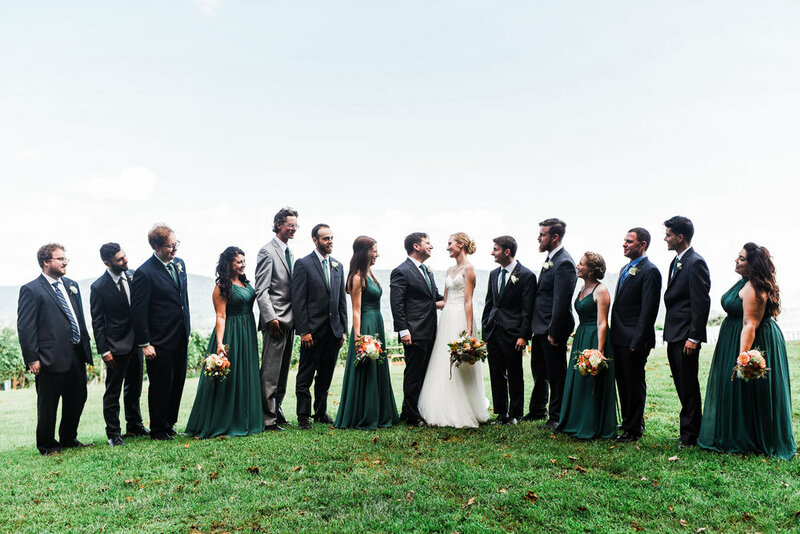 Darian and James chose a gorgeous color palette for their wedding back in May of this year. 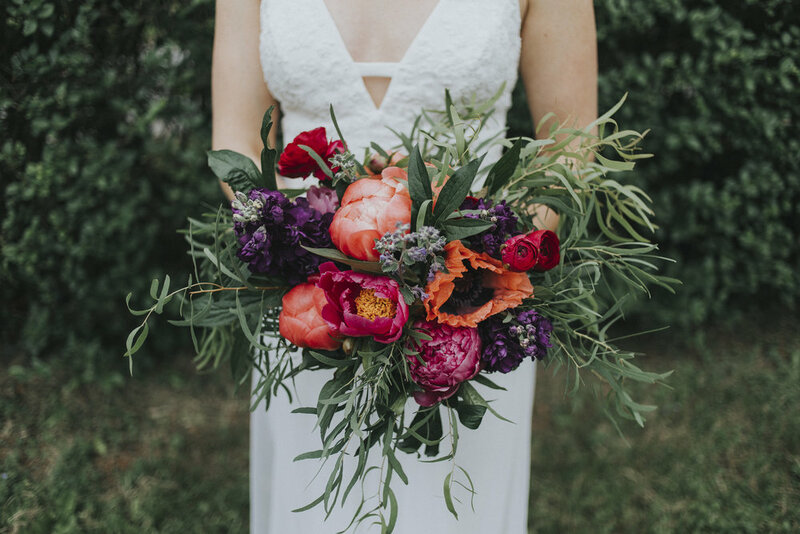 Coral, deep purple, bright pink and lush greens are hard to beat, and to top it all off, we had our earliest peony blooms to date just in time for their special day! This bouquet showcases almost all of our most favorite flowers; peonies, stock, ranunculus, and poppies. We are so grateful to Meagan Nicole Photography for the fabulous photos she captured and shared with us. Enjoy! We love Darian's vision for this arbor. The bright colored ribbon and the garland compliment each other nicely and create a beautiful backdrop for the ceremony. Hannah and Erik's wedding was a magical mix of simple, classy, and sparkly. Hannah's bouquet was filled with soft pinks, whites, and silvery grays with garden roses, lambs ear, hypericum, lisianthus, and dahlias. The baby's breath bridesmaids bouquets and boutonnieres were a perfect compliment! Enjoy these lovely photos captured by Christie Green Photography! A garland for the sweetheart table is the perfect touch of extra décor to set the couple apart. Sometimes baby's breath is just the right amount of florals for centerpieces. Congratulations Hannah and Erik! Thank you for choosing us to be part of your beautiful day! Margie gave us the reigns with her wedding flowers with one request, that they be colorful! We so enjoyed putting her bouquet together with the summers best and brightest from our gardens. Delphinium, Lisianthus, Fever Few, Cosmos, Celosia, and Billy Balls are represented here. Lately we have been using tricolored sage whenever possible for greens, it has fun variegated leaves and a lovely smell. We hope you enjoy the photos Margie kindly shared with us from her photographers. Spring is in full bloom here at Flourish and moving right along with the earliest peony cutting we have ever had! This wedding takes us back to the peak of last summer when sunflowers were taking center stage. Rachel graciously shared her photos with us captured by Tagna Bilden Photography, and now we share them with you. The yellow and white is striking against that royal blue! Sunflowers are such a classic choice, you can't go wrong, and they will be blooming again before we know it! 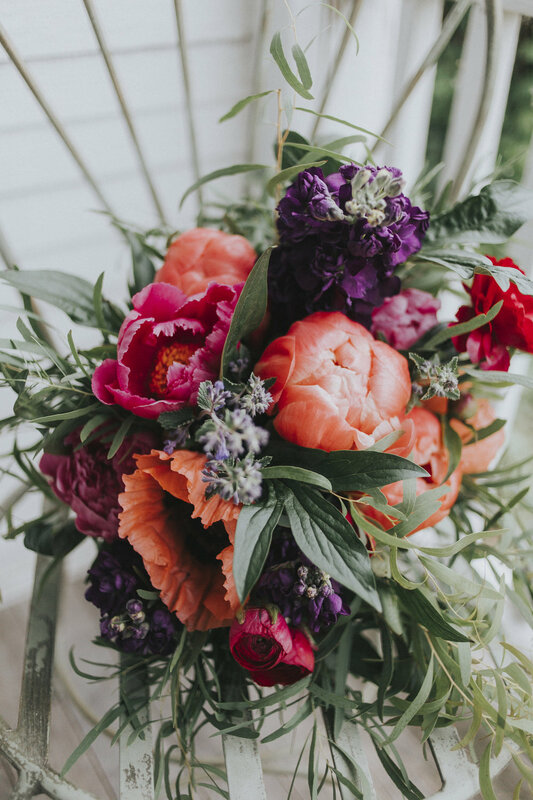 Rob and Abby's wedding flowers were sweet bunches of brightly colored blooms that looks like they were picked fresh from a luscious garden, and they were! We were delighted to use our own bells of Ireland, larkspur, lisianthus, fever few, and cosmos (just to make a few) to bring their wedding some summer color. Enjoy the photos from Ashley Crutcher Photography! It was a breezey beautiful day at Greystone Hall when these two said their I do's. We had the pleasure of adorning their day with white and touches of gold and greens. Emily Wren did a fantastic job capturing the beauty and we are thrilled to share her photos with you! This venue is a special kind of gorgeous. The grounds are incredible well kept and just perfect for floral accents. The arbor is one of our favorite pieces to work with at Greystone, and the large altarpiece arrangements are a tasteful way to frame the ceremony.